Tour de what? Tour de Fleece. It’s all about spinning during Tour de France. Oh. I need to explain spinning too. I’m not talking about those cycling classes. I’m talking about turning fleece, the wool off of a sheep’s back, into yarn. With a spinning wheel or a spindle. Yes, a wheel like in Sleeping Beauty. You’re supposed to challenge yourself. Spinning a certain amount, a certain type of fiber, etc. I’m doing this thing and I’m off to a decent start. I don’t have a wheel, just a spindle. Well two spindles. I’ve decided to work on a huge chunk of corriedale roving. The spindle and the roving have been there for… I forget. 5 years? Something like that. I got them as a Christmas gift from Mr. Mouse when we lived in Montreal. I tried a little and stopped. And then, last year, I did Tour de Fleece. My goal was to spin for 5 minutes each day. And I got the hang of it and I loved it. So I bought more roving and a new spindle even though I wasn’t done with the corriedale. And that corriedale has been staring me in the face. Accusingly. How dare I buy more roving when I haven’t even finished half of it! So this Tour de Fleece, I want to finish up this corriedale. I may not get to plying (that’s when you take 2 or more strands of yarn and twist them together to make one) but I’m turning it all into singles at least. 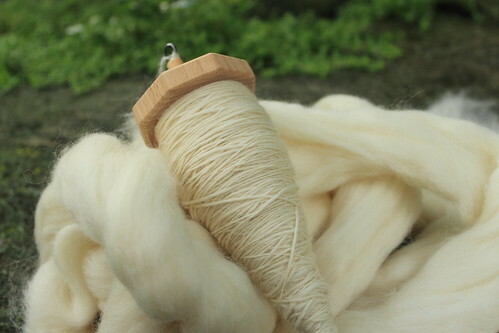 Turning the fluffy roving into yarn… Everything on the spindle has been done since the beginning of Tour de France.